It has been a while since I have reviewed a manga book. This is one of several atypical educational books that use graphic art to help teach difficult concepts or illustrate the action. This is another wonderful entry in the “Manga Guide to…” series that I have been reviewing. 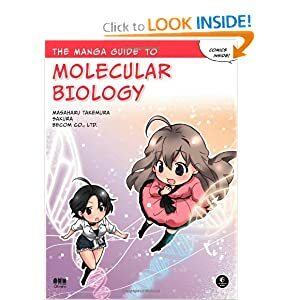 The Manga Guide to Molecular Biology follows the actions of a two students who failed their molecular biology class and have to take a special summer course. The story line is enjoyable and eases the reader’s entry into the topic rather than being a distraction. The book covers all the main questions and topics you would expect: what is a cell, what are the common parts of a cell, how do cells combine to make various organisms, what are proteins and how do they function within a cell, what is DNA and what are genes and how do they work to express the information coded in them? My favorite part was chapter 5 which focuses on potential applications for everything discussed earlier and theorizes what the future may hold in the field. I work in a software project that is helping biologists do research, including helping process the vast amounts of data that comes from genetic sequencing. As a result, I have become familiar with most of the content this book presents. I believe the book is accurate and it is clear. The story created to assist with that presentation is enjoyable as well. I have a seven year old daughter that is reading the book with great interest. Some of the science is above her grade level, but her attention remains fixed on the art and the story and she is absorbing some of it as she reads. Overall, I would say the book is a success and recommend it without reservation.